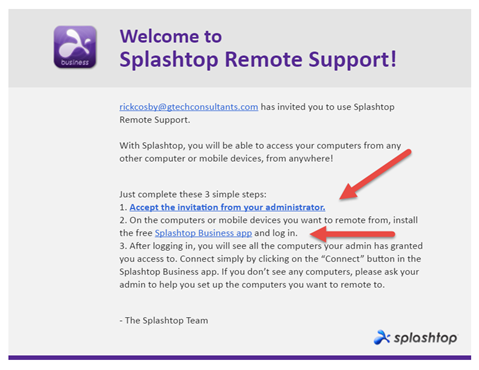 Splashtop is a remote program like LogMeIn and TeamViewer that we use to access remote machines. We also can invite our clients to access their own machines. If we have sent you an invitation, then these instructions will get you started. Start by looking at the invitation. There are 2 things that you need to do here. First, click the link that says “Accept the invitation from you administrator”. This will take you to the Splashtop site where you will enter your username and pick a password. Your username is the email address where you received the invitation. Pick a password that you will remember. 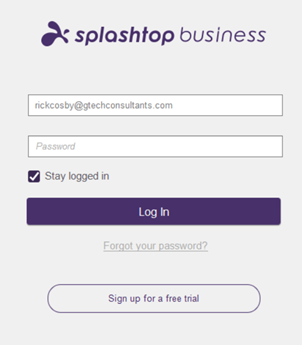 After you have created an account, you will need to download the Splashtop Business App and install it on the machine you want to remote FROM. This would typically be your machine at home or your laptop. Note that you do not need to install anything on your work machine. We have already done that for you. Make sure that you pick the app that matches your machine. Most of you will pick the top choice since you will probably be installing it on a Windows machine. Pick Mac OS X if you are installing it on a Mac. You can also install it on your iPad, iPhone, or Android device but if you want to do this you will get it from your App Store on the device. Be sure to get the Business (not Personal) version. These mobile apps are not particularly useful for productive work. The first time that you run the business app, you will need to sign into your account using the username and password that you picked earlier. 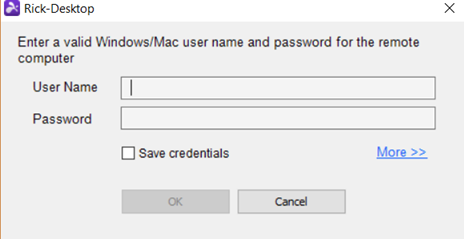 You can also check the box “Stay logged in” and it will remember your password. That said, the first time you attempt to log in on any new device, Splashtop will email you a warning. You will have to click over to your email and approve the device before you can return and log in again. This is a security measure that prevents unauthorized use of your account. Once you are logged into your account, you can see the machine(s) that you can remote into. Click once to highlight the machine and reveal the buttons, then click on the connect icon to connect to the machine. You will need the username and password of the work machine to connect to it. If the machine is locked, then you may also have to enter the username and password into the remote machine to unlock it. You can find the button to send a CTRL-ALT-DEL command to the remote machine as well as other commands on the toolbar hidden at the top of the screen. Look for the dropdown menu. In Splashtop, you do have to set it up for remote printing if you are going to need that functionality. On the File Menu in the Business App is a button for remote printing. We don’t use that ourselves so it might not be set up for you. Basically, you have to open Splashtop on the work machine, go to settings, and install the remote print driver. Once you do this you can print to the Splashtop Remote printer and your home default printer will be used. If you let us know in advance that you need this functionality, we will make sure that it is installed for you.